The results of 2018 elections for the national and provincial assemblies highlights a new reality for the TLP. The party has made an electoral beginning. Though the number of seats that the TLP won is insignificant (two seats for the Sindh Provincial Assembly), this is a remarkable electoral debut. While the rise of the PTI in 2018 elections has been widely discussed within and outside Pakistan as a new political wave, another significant one, which has not received adequate attention, is the rise of Tehreek-i-Labbaik Pakistan (TLP). Though the number of seats that the TLP has won for the National Assembly and four Provincial Assemblies are insignificant, a detailed analysis of the number of votes and its percentage projects a different outcome – the electoral rise of a new radical political party with strong religious views. While the traditional religious parties led by the Jamaat-e-Islami (JI), JUI (Fazlur) and other components of the Muttahida Majlis-e-Amal (MMA) have performed poorly in 2018 elections when compared to the last three elections, how did the less than one-year-old TLP, manage better? That too when the TLP contested on its own without any partners, whereas the MMA participated as an alliance? In particular, how to analyse the electoral performance of the TLP in certain regions of Pakistan, for example in Lahore and Karachi, where the party has polled third largest votes, better than those established political parties? The Tehreek-e-Labbaik along with the Milli Muslim League is the latest religious political party to join the electoral fray in Pakistan. While the MML faced problems from the Elections Commission of Pakistan (ECP) in getting the same registered as a political party due to former’s links with Hafiz Saeed and Jamaat-ud-Dawa (JuD), the TLP’s rise – political and electoral, during the last one year have been spectacular. Until two years before neither the TLP nor its founder Khadim Hussain Rizvi was not known even in the political circles of Punjab, let alone Pakistan. Both Rizvi and the TLP owe their success to Mumtaz Qadri, who assassinated Salman Taseer in 2011, the then Governor of Punjab. Mumtaz Qadri was a part of Governor’s Elite Commando Force; instead of protecting him, Qadri pumped a volley of bullets on the hapless Taseer in broad daylight in a market in Islamabad. Taseer was one of the most outspoken critics of the blasphemy law and its misuse in Pakistan. Khadim Hussain Rizvi became prominent with the trial of Mumtaz Qadri. Rizvi was able to mobilise a substantial number of Barelvi followers, especially in Punjab to support Qadri and his cause. Though Qadri was finally hanged in 2016, Rizvi had succeeded in politically gathering a section. The funeral of Qadri further consolidated this section; according to estimates, more than 100,000 took part in the ceremony. Though some of the other religious parties also supported Mumtaz Qadri and his beliefs, Rizvi succeeded in converting the same into political votes. The turning point for Rizvi’s political agenda and the TLP was undoubtedly the election for the National Assembly Seat in Lahore (NA-120). The focus of the elections was then on Nawaz Sharif and the PMl-N. The election took place because of Sharif’s disqualification by the Supreme Court. Kulsum Nawaz won the elections with 71,000 votes, followed by PTI’s Yasmin Rasheed who polled 47,000 votes. The TLP supported came third in the NA-120 elections. The TLP in the above elections in Lahore, polled more than the PPP and other religious parties, including the JI. In fact, the TLP candidate polled more votes than the PPP and JI put together in this election in September 2017. The election marked the political beginning of the TLP. The TLP repeated its performance in another national assembly election in October 2017, this time in Peshawar for the NA-04 seat. Though this election was won by the PTI, followed by the Awami National Party (ANP) and the PML-N, the TLP supported candidate got close to 10,000 votes. Again, as in the case of Lahore, the TLP candidate more votes than the traditional religious political parties lies the Jamaat-e-Islami. The above trend would continue in 2018 elections as well – both for the national and provincial assemblies. The TLP has started outperforming the other religious political party. And even better than the established liberal parties in the region. Since the two elections for the National Assembly in September 2017 for Lahore and Peshawar, there is no turning back for the TLP. For Rizvi, a substantial political boost came in November 2017 on a totally different issue. His group – then referred as the Tehreek Labaik Ya Rasool Allah (TLY) wanted to restore the original clause and a particular sentence of the Khatm-i-Naboowat declaration in the Election Act 2017. An Election Bill passed in October 2017 made a minor change on a paragraph relating to one’s belief on the finality of the prophethood (The Bill replaced the phrase “I solemnly swear” with “I believe”). Though the government subsequently restored the original phrase, referring the changes as a “clerical error”, the TLY would not accept it. Though the TLY started their protest in Faizabad demanding the restoration of the original clause in the oath, it expanded the call to sack the minister of law. 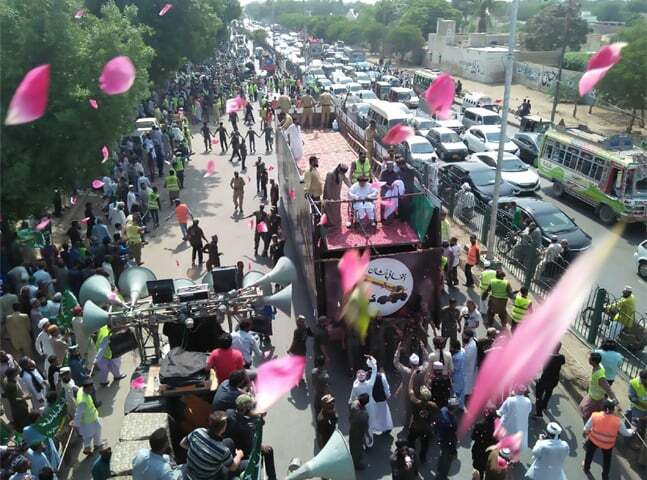 Rizvi gathered a group of the TLY supporters and occupied the Faizabad interchange – a strategic location linking Islamabad with Rawalpindi. The PML-N decided inaction as a strategy, leading to Rizvi increasing his political clout. When the government finally called on the military to disperse the protesters, the Establishment chose to strike a deal with Rizvi. The agreement met most of the demands, including the removal of the then federal law minister! The agreement signed between the TLY leadership and a serving Major General was something that Rizvi would have never expected. The Faizabad protest catapulted Rizvi into national scene, gave him an opportunity to strike a deal with the Establishment, and made the PML-N look impotent. When the TLP votes and its percentage are compared to the other parties, especially the other religious political parties in Pakistan, one could appreciate its significance. Consider the following. First, in the 2018 elections, the TLP has emerged as the third largest party in Lahore, following the PML-N and PTI. Though the primary contest was between PML-N and PTI, neither the PPP nor other regional parties in Punjab that could gain more votes than the TLP in Lahore. Even the religious political parties that took part in the elections collectively under the MMA banner could not win more votes than the TLP in Lahore! Second, elsewhere in Punjab outside Lahore, the TLP has played a vital role as a spoiler between the PTI and PML-N. In more than ten constituencies, the TLP has polled more votes than the difference between the winner and the runner from the same constituency. In other words, had it not been for the TLP dividing the vote bank, perhaps the winner could have been a different one! Once the Election commission of Pakistan (ECP) announces the final results with full details, a better analysis could be made on this point, with a comparative study of the last four elections in those constituencies. Third, one could observe a similar trend in Karachi as well, where the TLP has secured two seats for the Sindh provincial assembly. While the primary contest in Karachi has always been between the MQM and PPP, this election has witnessed the emergence of the PTI and the TLP. Though the PTI has secured a substantial number of seats for the national assembly from Karachi at the cost of MQM and ANP, the TLP in specific constituencies has fared better than the PPP and MMA! Again, one has to wait for the complete dataset of 2018 elections to analyse the rise of TLP in Karachi. Whose vote bank in Karachi did the TLP cut into? What does the rise of TLP in Karachi mean? Fourth, the number of votes that the TLP has polled in 2018 elections – a substantial 2.2 million! All the other religious political parties of Pakistan put together could poll only slightly more (around 2.5 million) than the TLP. When compared to the fact that the other religious parties, for example, the JI and the JUI factions have a long electoral history, the TLP’s performance in its first election is substantial. Also consider the fact, that the TLP is not even one year old! The rise of TLP needs a more extensive analysis than just based on elections – regarding how many votes it has polled and where it has done well. As the electoral dust settles in Pakistan, and the ECP publishes a comprehensive list – a voting pattern could be observed, leading to a broader analysis. First and the foremost question would be – where does the support for the TLP come from? Is it a part of the religious vote, led by the Barelvis but dipping into the religious vote bank, or is it a new phenomenon, outside it? Second, what does the strong electoral performance of the TLP especially in Lahore and Karachi – the two cosmopolitan cities of Pakistan mean? The TLP may still not have the electoral power to win the seats, but it hints adequate street power to paralyse politics. Third, what does the TLP’s rise mean for political parties (outside the religious ones such as the JI, JUI etc.) such as the PML-N and MQM, especially in urban Punjab and Sindh? What will be PML-N’s calculations now in Punjab, with the rise of TLP? Fourth, how will the other religious political parties respond to the rise of TLP? From JI to JUI-F, these parties have a political history, grass-roots presence and adherence to a particular religious ideology. Will the rise of TLP push the religious political parties to further right? Fifth, how would Khadim Rizvi interpret the electoral gains of the TLP, and chart a political course in the subsequent months in Pakistan? Having tasted success using narrow religious interpretations, what would be his next political moves? Look at the TLP’s trajectory in using the following symbols – Mumtaz Qadri, Blasphemy Law and Khatm-e-Nabuwat. What will be his next course of action? Finally, what will be the TLP version of Naya Pakistan? Prof D. Suba Chandran is Dean of the School of Conflict and Security Studies at the NIAS, IISc Campus, Bangalore. An abridged version of the above was first published in the Rising Kashmir.